The 2011 Holiday Gift Guide! Home > 2011 > November > The 2011 Holiday Gift Guide! Okay, it’s pretty obvious that I love games. I’d rather get a game than anything else for Christmas or any other gift-giving celebration. Maybe you like games too, or you think that someone on your gift list would appreciate some sort of game. But there’s just so many games out there these days, and frankly, a lot of the ones you’ll find in mass-market stores are pretty terrible. But there’s no reason to fear, my 2011 Holiday Gift Guide is here! Below, you will find 25 games that I think will make really fantastic gifts. Between the different categories, you should be able to find a game for almost anyone. And if that’s not enough, most of the games I mentioned on my previous gift guides are still available, so you can check them out for even more ideas: 2010 Gift Guide, 2009 Gift Guide, 2008 Gift Guide. Shake ‘n Take – This is a silly game about trying to capture all the aliens on your player mat. Buy while you’re trying to roll the right shape and circle them, your neighbor is rolling another die over and over, trying to get the alien face to come up, so they can then steal the marker from you and take their turn capturing aliens. It’s way more fun than it should be, and even works well for families and even younger children. You can check out my full review of it for more information. 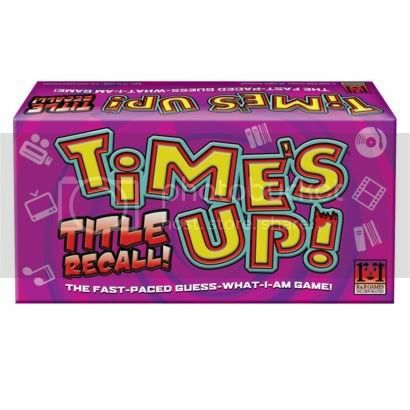 Time’s Up: Title Recall – In this game, you deal out 40 cards containing titles of books, movies, songs, or other things. Over 3 rounds, teams compete in a password-style game to get their teammates to guess what the Titles are. The cool and fun thing is that you have to do it with less and less information throughout the game. So while you reuse the same Titles in each round, in round 2 you can only use 1 word plus as many gestures as you want to get them to guess the Title, and then you can only use gestures in round 3. It’s a lot of fun and almost guaranteed to build some long-term hillarious memories! 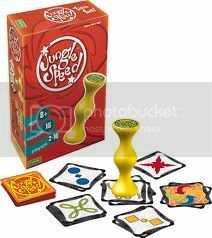 Jungle Speed – Here’s the idea: A totem sits out in the center of the table. Players flip cards in turn until they flip one that matches another player’s card. Then, in a flurry of action, both of those players lash out and try to grab the totem first, sticking the loser with all the cards in their pile. It’s crazy and frantic and a lot of fun. 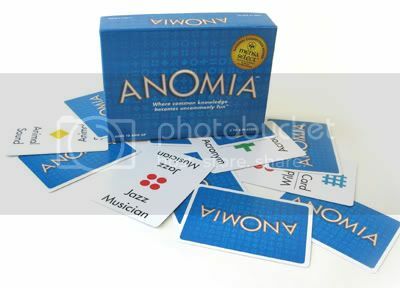 Anomia – In this small-press game, players flip cards in turn sort of like in Jungle Speed. These cards, however, have some sort of category on them as well, and when you flip a card that matches someone else, you have to quickly name something that matches the category on the other player’s card. Quick thinking is the skill here rather than the quick reflexes of Jungle Speed. 3-6 players, 30 minutes to play, Cost: $15-20 – Available online and in some specialty book and educational stores. 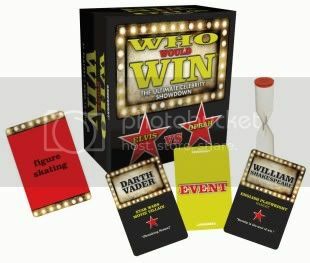 Who Would Win – Two players each flip over people cards… let’s say they get Darth Vader and Oprah. Then they flip over an Event card… maybe it’s Figure Skating. So, who would win? Those two players make their best case in about 20 seconds to everyone else in the game, who then vote on which argument they think is best. It’s silly and fun, especially for people who are creative and can think on their feet. These games are aimed at young children, or are games that school-age children could play on their own without adult help. But the cool thing is that they still tend to actually have enough universal appeal for adults to have some real fun playing them as well! 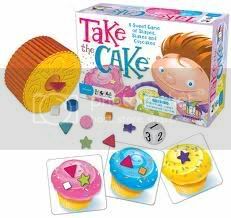 Take the Cake – Children take turns trying to shake wooden “sprinkles” out of a little plastic thingy that they can use to collect cupcake tiles. It’s cute and appealing and fun. You can also check out my full review for more information. 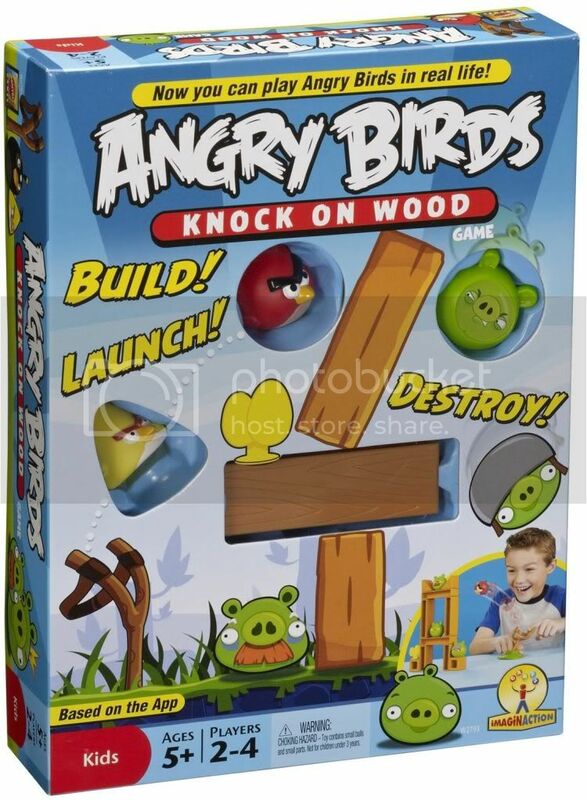 Angry Birds: Knock on Wood – Angry Birds is obviously crazy popular on all sorts of mobile electronic devices, and most kids are aware of what it is. In this game, you basically get to build little fortresses for the bad little piggies and then the other player literally uses a little catapult to throw the angry birds at it. Whether you play by the rules or just take turns building things and knocking them down, it’s actually a lot of fun. Animal Upon Animal: Balancing Bridge – In this game, you’re stacking cute little animals in the middle of a bridge running over top of the board. Each player has a hand of 3 cards, showing 3 animals that they want to get next to each other in the stack. So when you complete a card, you discard it, and the first player to get rid of all their cards is the winner. But if you knock over the stack when placing a new animal, you have to draw another card. 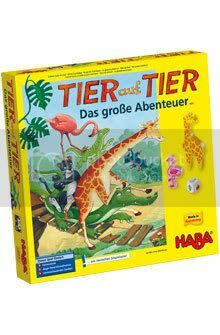 This is a really nice new take on the Tier auf Tier game I’ve mentioned before. 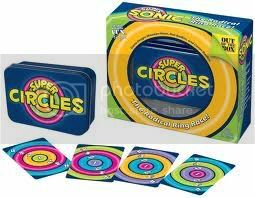 2-4 players, Ages 5+, 15 minutes to play, Cost: $40-50 – Available in some hobby game stores, some educational toy stores, and online. Cars 2 Sorry Sliders: World Grand Prix Race Edition – I’ve listed Sorry Sliders on previous guides, which is a really great sliding/finger-flicking game, sort of similar to shuffleboard or crokinole. 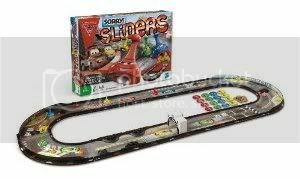 While this new licensed version still uses the same little pawn-shaped pieces containing a ball-bearing to make them slide/roll, it’s different because it is a race game travelling around a track. Both for the Cars theme and the great gameplay, I imagine that this would be a big hit with most kids. 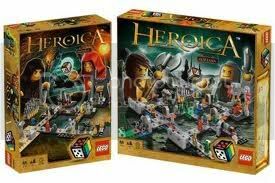 Heroica – I’ve mentioned some of the Lego games before, but this is a new line of dungeon-exploring adventure games. It’s a simple dungeon-crawl experience of fighing monsters and collecting treasure that is modular and expandable with a number of different sets currently available. These are some games that the whole family can play together. There’s some actual strategy involved in all of these, but they’re still pretty lightweight and appropriate for school-age and older children (perhaps with some adult supervision for help setting them up or managing the game), as well as adults. And unlike a lot of mass-market “family” games, these games are actually fun for everyone as well! 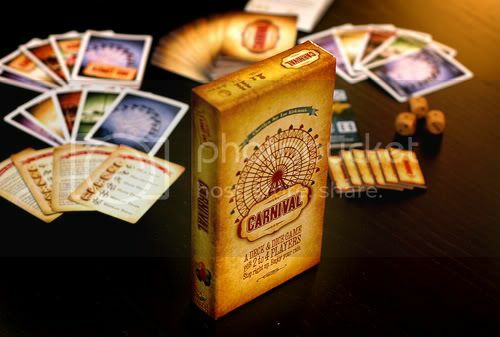 Carnival – This is a very unique cards-and-dice game about collecting the parts you need to open rides and have the best carnival. I think that it has the cool ability to appeal on several different levels, where some people could take it for the simple set-collection game it is at its core, while others can find quite a bit of complexity in some of the choices the game offers. I’ve already written a full review of this game, so you can check it out for even more information! 2-4 players, 30 minutes to play, Cost: $20 – Currently on preorder from Game Salute (Click here to order). Will eventually be available in game stores. 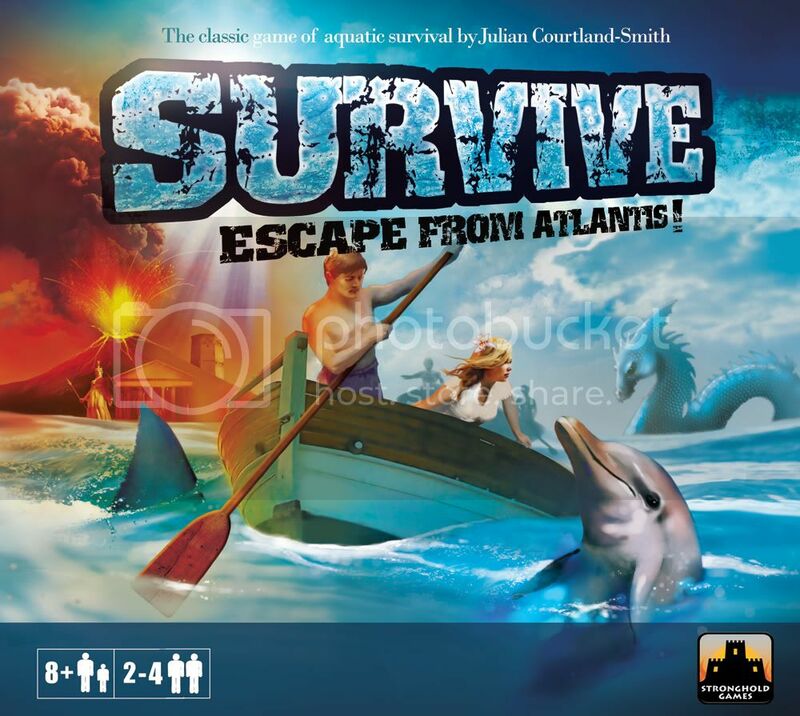 Survive: Escape from Atlantis – Atlantis is sinking! Apparently, it wasn’t a nice place, though, because in addition to saving your own people, Atlanteans seem to go out of their way to lead sea monsters, sharks and othe nasty things towards the other survivors attempting to escape. This is a gorgeous classic game full of “take that” moments that will really bring the fun to almost any family. 2-4 players, 60 minutes to play, Cost: $50 – Available in Barnes & Noble, in hobby game stores (Hypermind), and online. hange”? 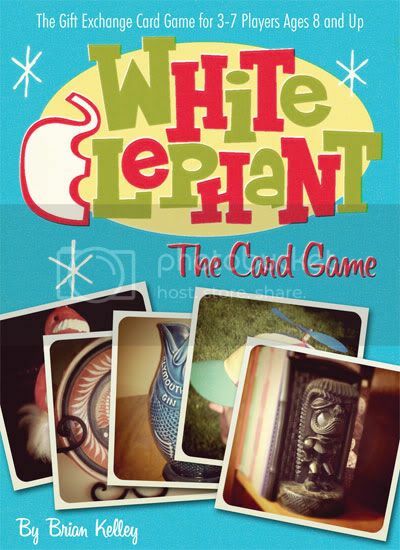 This light card game is that experience boiled down into a quick and fun gift exchange game that you can play any time. The cards picture hillarious junk from someone’s attic that you try to sift through to find the gems that people on your Christmas list might like. I’ve also written a full review of this game, if you’d like even more information. 3-7 players, 15 minutes to play, Cost: $15 – Currently on preorder from Mayday Games (Click here to order). Will eventually be available in game stores and other retailers. 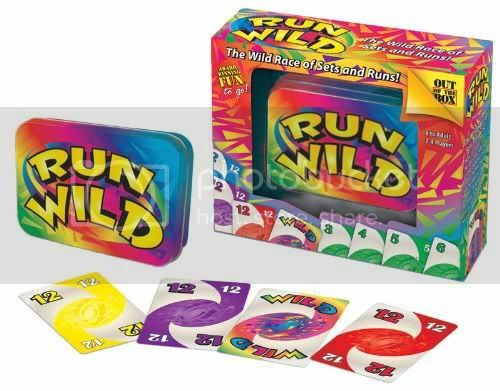 7 Ate 9 / Super Circles / Run Wild – These are actually 3 similar games all based around simultaneous card play. So instead of turns, you play cards from your hand as soon as you see the opportunity to do so. 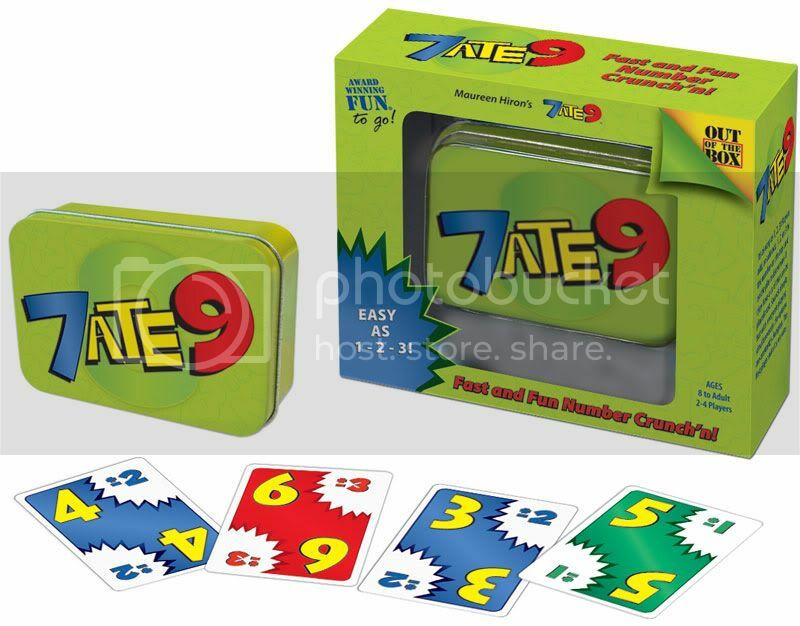 In 7 Ate 9, you’re playing cards based on doing simple addition and subtraction, in Super Circles, you’re matching colored circles from one card to another, and in Run Wild, you’re playing cards out rummy-style to sets on the table. They all have a similar real-time experience, but each particular game can appeal to different people based on what sort of mental strengths they might have. 2-4 players, 5-10 minutes to play, Cost: $10 – Available at Barnes & Noble, hobby game stores (Hypermind) and online. 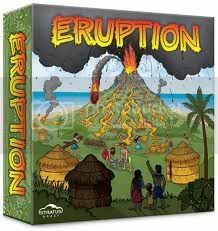 Eruption – I haven’t actually gotten the chance to play this yet, but it’s a gorgeous game about trying to protect your village from an erupting volcano while directing the lave towards your neighbors. It’s another light, “take that” family game that seems to be very simple and fun. 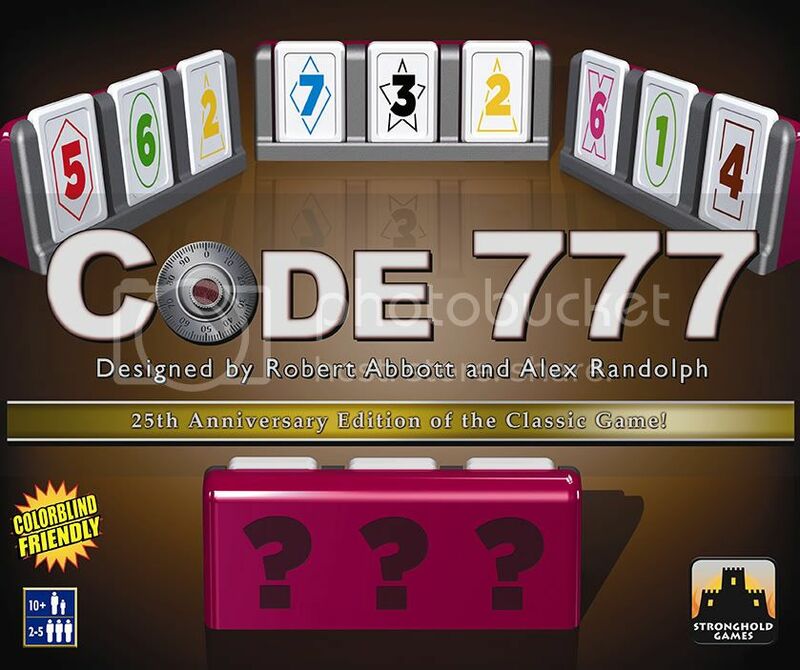 Code 777 – This is a classic deduction game where you’re trying to figure out the three number you have in front of you. Since you can see everyone else’s numbers, however, each round you’ll answer a question that will give them some information about their tiles. It’s pretty educational regarding things like logic, paying attention, and using deductive reasoning and can be a little brain-burny at times, but it’s also very simple to learn and is surprisingly fun. 2-5 players, 30-60 minutes to play, Cost: $35 – Available at Barnes & Noble, hobby game stores (Hypermind) and online. 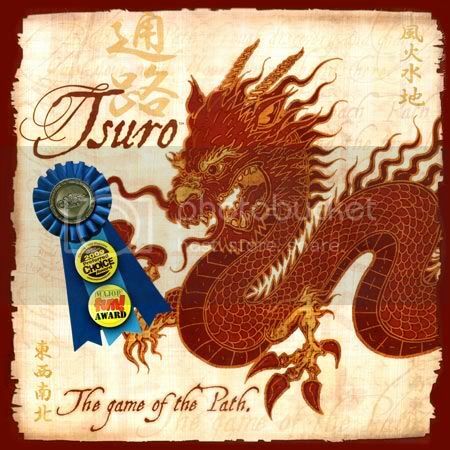 Tsuro – This is a simple tile-laying game where you are building paths for your pawn by placing tiles in front of it. Each tile has a number of these paths coming in from 8 different point, but which often cross, turn, and change your direction. Eventually, when you all start to meet in the middle, tiles you place will cause other players to move as well, and if your pawn ever runs into another pawn or falls off the board, you are out, with the last player standing being the winner. It’s very quick and fun, and it can accomodate a wide range of ages and number of players. 2-8 players, 15 minutes to play, Cost: $25 – Available at Barnes & Noble, hobby game stores (Hypermind) and online. 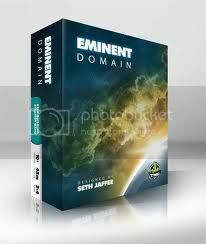 Eminent Domain – This is a card game with the theme of building a space empire through taking certain actions each round that both give you immediate benefits and which also are added to your personal deck of cards, which will influence how you’ll be able to play on future turns. Despite have the “deckbuilding game” label attached to it, I think it plays very differently from something like Dominion, and so far, I’ve discovered that there are a lot of possible strategies that you can use, as well as a lot of skill to develop in regards to hand management and timing your actions. It’s relatively quick and simple to learn, but has surprising depth and replayability. 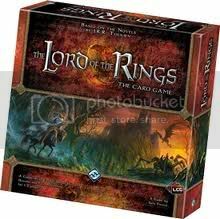 Lord of the Rings: The Card Game – Obviously, this is a card game based on the Lord of the Rings trilogy. It’s actually cooperative, so you work with other players against the game iteself, and you can even play it solitaire. It is a “living card game”, which means that it is similar in a lot of ways to collectible card games (like Magic the Gathering or Yu-gi-oh). What I think is cool is that you can approach this game on several different levels, all the way from buying just the base set and playing it as an off-the-shelf coop game up to buying into the whole system and picking up all of the expansions to build your own, custom decks to face new and more difficult quests. You can check out my review of the base game for more information, but I definitely think that any fan of the books/movies would appreciate the depth of the theme that comes across in this game. 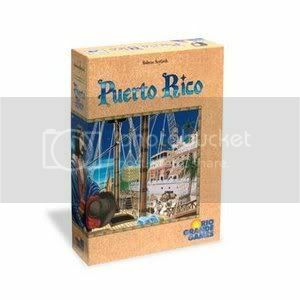 Puerto Rico – This is one of the classics of modern boardgaming, but I didn’t really discover all it has to offer until this past year. Ostensibly, it’s about running a colony in Puerto Rico, but more than anything else, it’s a true masterpiece of resource management, balancing tactical vs. strategic play, and timing your moves just right. It has quite a reputation about being rough on new players, but if you and your group/family are all new to it, there’s absolutely nothing to worry about (the problem is more about mixing players of drastically different experience). 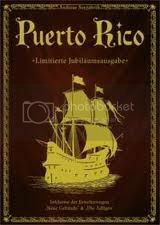 There’s also a brand new, lavish 10th anniversary collector’s edition available if you happen to have a die-hard Puerto Rico fan on your holiday gift list. 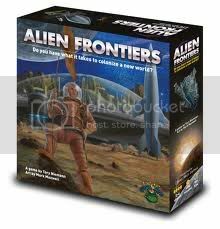 Alien Frontiers – This is a really cool dice-based game about colonizing an alien planet. Each round, you roll your dice and then decide how to place them among the various actions around the board to collect resources and do different things. And between that, the abilities you can get from collecting Alien Technology cards, and the influnce of controlling different regions on the planet, players have a lot of options on how to put together their actions each turn. The game is gorgeous and fun, and even though there’s a lot of depth if you want to go looking for it, it’s also very approachable to nearly any gamer. 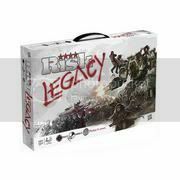 Risk: Legacy – Yep, this is basically the Risk you’re always known about. Except that it’s been streamlined to finish in 60 minutes or so. And the “Legacy” is a new concept where players make permanent changes to the game, rules, and board based on the outcome of each game. From what I understand, it takes about 15 games to fully explore the entire evolutionary changes available, which include things as simple as renaming cities and countries all the way up to revealing new sections of the rulebook and tearing up cards completely. There’s some debate about whether or not this is a good idea amongst hobbyists, but to me, it’s thoroughly intriguing. 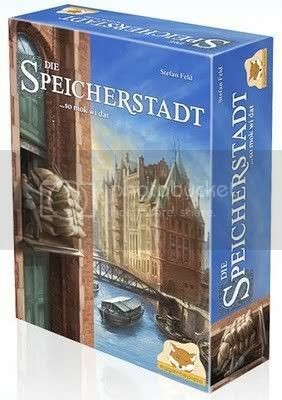 The Speicherstadt – The core mechanic in this game is a very simple and elegant auction. However, after just a few rounds, players find a surprising level of depth and intricacy in how it plays out each turn. The Speicherstady has the simplicity and length of nearly a filler game, but always feels like a very meaty experience every time I play it. For each entry, I’ve tried to give you some indication where you might can find these games, but sometimes that can be affected by availability and other factors. My favorite place to buy games is Hypermind, the local hobby game store in Burlington, NC. It’s located on South Church Street in the Rosewood Village Shopping Center right between Tuesday Morning and the Season’s Buffet Chinese restaurant. • Amazon – You can find almost anything on Amazon, including many of the games on this list. • Gate Play – Slightly smaller inventory, but focuses more on people new to the boardgame hobby. And for even more recommendations, also check out the Dice Hate Me Holiday Gift Guide and the holiday buying guide at BoardGameGeek. The only one I don’t quite agree with is Tsuro – I find it pretty boring and one-dimensional. Of course, I have Defenders of the Realm on my list, so I’m sure you’ll have that same comment over there. I came very close to putting The Speicherstadt on mine, as well, along with Alien Frontiers and Eminent Domain. I may have to expand my list next year – there are too many good games to recommend! I guess I need to make one too. Tsuro is in the family category, and I think it’s very appropriately placed there. Literally anyone can play it, even if they do so randomly, but there is also some level of skill involved for people that can grasp it. I don’t own it currently, but would love to have it in my collection for when the girls get a little older. I’m really glad about choosing last year not to repeat any games from year to year. The old lists are still there and are mostly viable (barring something occasionally going out of print), but there’s just so many new games that come out each year, I hate to list the same ones over and over (which is the only problem I see with the BGG list). It’s a lot more work to develop the list each time, but if you pay attention through the year, it’s not that bad. And yeah, Defenders is just a terrible choice. What were you thinking? Next Post: Secret Santa Comes Through Once Again!